ROME — A boat carrying as many as 300 migrants from Libya capsized off the Italian coast yesterday, leaving about 250 people unaccounted for. Survivors told of desperately trying to reach rescue boats as those unable to swim screamed in the darkness and pulled one another under the water. 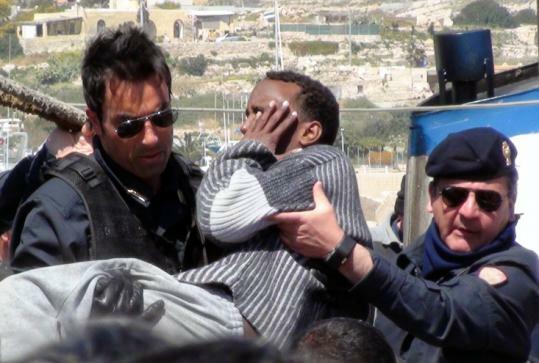 The Italian coast guard rescued 48 people yesterday, and a fishing boat picked up another three. Survivors told the International Organization for Migration they swam toward coast guard vessels, but many others drowned. Coast guard official Pietro Carosia said the rescue operations were frustrated by strong winds and rough waters. The capsizing occurred 40 miles from Lampedusa, an island closer to North Africa than mainland Italy. Carosia said the boat had probably been at sea for about two days.